Located directly on the quiet beach promenade of Mirow we rent our family friendly, quiet, apartment (96 sqm) for up to 8 people. It is located on the 1st Floor. We offer you a carefree holiday. 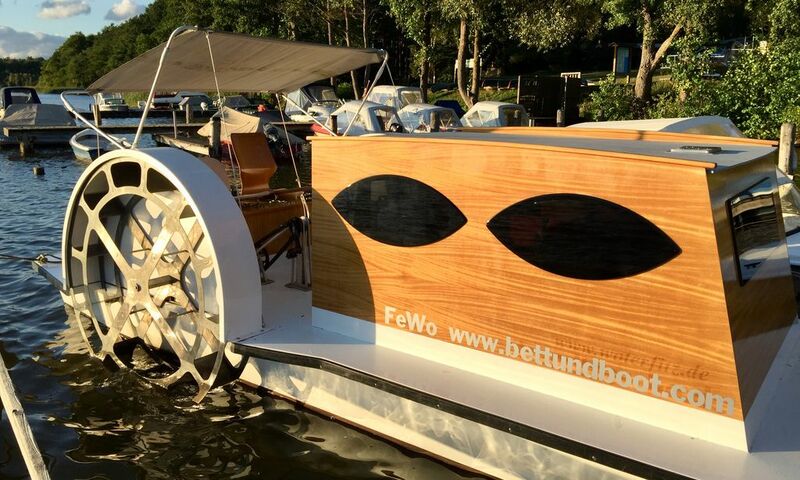 For example, enjoy a ride on our raft "Bed & Raft" on the waters of Mecklenburg's Kleinseenplatte Wasser. It's exciting! In the apartment you can enjoy a lake view from the large living room with open kitchen and dining area (American kitchen). The large sofa area offers 8 people cozy space, the Flat HD TV with Ambilight provides in bad weather for entertainment. On the large loggia a rattan lounge area invites you to sunbathe and relax. Each bedroom is designed in a different theme. A master bedroom in Mediterranean colors and rattan bed, a master bedroom in creamy white and a children's bedroom with bunk beds. Highchair and travel cot are available on request. In the garden there is a barbecue area with rustic Baumholzsitzecke, a playground with space for their kids to romp and pretty perennial flowerbed. The beach of Mirow with large lawn, beach, snack bar and restaurant is just 3 minutes walk away. For every booking there is a great family raft "bed & boat" available on Tuesdays, Wednesdays and Thursdays. It is suitable for 4 people as a bathing platform, excursion boat, sun island and who also likes to stay. (2 persons) Located in Granzow, only 3 km away on an idyllic jetty. In addition, you can use a canoe by Gatz for 4 people throughout your stay. Furthermore, there are 50m away from the apartment a large playground with swings, slides, helicopters, boat, table tennis and lawn maze. The washing basket is ready with nets in the apartment, put in front of the door you get this washed, hurled back. 1 parking space on the property, additional parking directly in front of the property in the quiet street. Our apartment is individually, lovingly and appropriately equipped. (medium equipment) On the property there is a cozy barbecue area with lake views from solid wood. Good location and very spacious! We enjoyed the stay very much. The property is in a very good condition and also very spacious, i.e. big enough for 4 children and 4 grown ups. You can see the lake out of the window and a small beach is within 2mins walk. Mirow offers supermarkets, bakeries, bicycle hire places etc. Overall highly recommended. Wir waren zu fünft in dieser sehr schönen, geräumigen Wohnung und hatten ausreichend Platz. Der Blick vom Balkon ist wirklich entspannend. Der Mirower See läd zum Boot fahren ein, was sich mit dem Floss auch wunderbar bewerkstelligen lässt. Vielen Dank für den schönen Urlaub und für Ihre Gastfreundlichkeit. Sehr freundliche Gastgeber, sehr schön gelegen direkt am See. Kommunikation war sehr gut! Wir haben uns rundum sehr wohl gefühlt!!! Sehr schöne, saubere und super gelegene Ferienwohnung. Nur wenige Meter bis zum Strandbad, so dass man auch nach einem Ausflug noch kurz Baden gehen kann. Alles Nötige in Mirow war gut fußläufig zu erreichen. Besonders toll war, dass wir das Kanu und das Tretboot auf dem wunderschönen See benutzen konnten. Der Kontakt war sehr zuvorkommend und freundlich. Wir haben uns wirklich wohlgefühlt! Vielen herzlichen Dank! Ideal für Familien. Direkt am Spielplatz und See. Unser Kurzurlaub in Mirow war wunderschön und sehr entspannend! Die Ferienwohnung hat uns sehr gut gefallen und die Einrichtung hat unseren Erwartungen vollkommen entsprochen! Der Kontakt mit der Vermieterin war sehr freundlich. Die Umgebung lädt auch im Winter zu wunderbaren Spaziergängen ein! The small town of Mirow invites you to relax with Schloßinselromantik. Surrounded by the enchanting forest and lake landscape of the Mecklenburgian Kleinseenplatte, Lake Mirow is connected to the Müritz via the Müritz Havel waterway. Variety offer a variety of sports facilities in and around water. Almost unlimited canoe-kilometers in 3 different directions, fishing, water skiing (300 m), beach volleyball (300 m) and perfect surfing areas (Boeker Mühle, Müritz ca: 12 km). Splashing and swimming you can almost on the doorstep in the beach Mirow - or in one of the "thousand" other lakes. The Müritz National Park (next entrance in approx. 5 km) can be discovered by foot, bicycle, canoe, carriage or horse. In spring and autumn, tens of thousands of cranes gather, a spectacle for birdwatchers. And if you do not feel like "nature", explore the idyllic towns of Neustrelitz, Röbel or Waren. There is a fun bath with sauna in Röbel (approx. 15 km), a small fine sauna in Granzow (3 km).